A monument commemorates Australian servicemen and women who have served in conflicts in which Australia has been involved. The memorial was originally unveiled to commemorate the fallen of World War One. 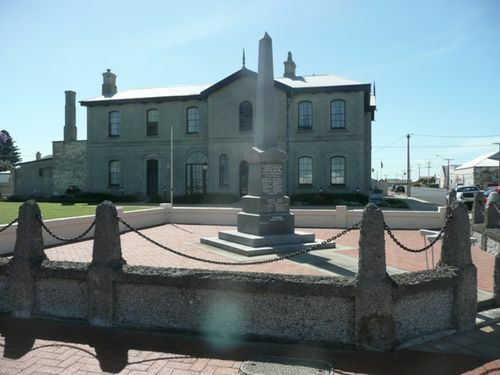 The foundation stone of a memorial for the soldiers from Port MacDonnell, Mount Schanck, and Allandale, who fell in the great war of 1914-18, was laid on Monday, June 13. The memorial is a granite obelisk, which is about 15 feet high. The memorial stands on a cement concrete foundation 9ft square, and the basement is 7ft. square The pedestal consists of two steps, over which is the foundation stone (a massive-block about 2ft. 6 in, square). Over the foundation stone is a large polished block, on the face of which is the inscription, including the names of the fallen soldiers (21). The lettering is gilt, and a gold line runs round the face of all the monument that is polished, obelisk included. The inscribed block is surmounted by a handsomely designed cap and above this is the obelisk, which is 7ft. 6in. long. 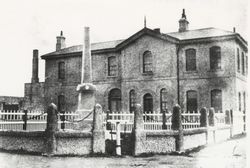 The contractor for the memorial is Mr. A. Burrell, of Mount Gambier, but several parts were prepared and polished at Bendigo, the granite being quarried at Mount Alexander, Victoria. The contract amount is £165, but it will cost about £200. The foundation stone was laid by Mr. R.C.Hayman, as Chairman of the District Council of Port MacDonnell, in the presence of a large attendance of residents of the district. The Narracoorte Herald (SA), 5 July 1921.